2. The Microsoft Outlook 2010 Start up window automatically appears. Click Next. 3. The Mail Upgrade is optional and outside the scope of this guide. If this page appears, click Do not upgrade. Click Next. 4. The E-mail Accounts page appears asking Would you like to configure an E-mail account? Click the Yes radio button, and then click Next. 5. In the Auto Account Setup window, click the Manually configure server settings or additional server types radio button, and then click Next. 6. In the Internet E-mail Settings window, enter your information, then click More Settings. 7. In the Internet E-mail Settings window that appears, click the Outgoing Server tab, and enter the following. Other settings are at your discretion. Click the OK button. 9. You are returned to the Internet E-mail Settings page. Click Next. 10. If you clicked the box for Test Account Settings by clicking the Next button, the Test Account Settings window will appear to allow you to confirm your account settings. Once completed, click Close. 11. You are returned to the Add New Account page. Click Finish. 12. If you are connected to the Internet, make a test e-mail. 14. From the File menu, choose Info and then click on the Add Account button. 15. On the E-mail tab, click on New. 16. If the Mail Upgrade window appears, it is optional and outside the scope of this guide, so click Do not upgrade and then click Next. 17. The E-mail Accounts page appears asking Would you like to configure an E-mail account? Click the Yes radio button, and then click Next. 18. In the Auto-Account Setup window, click the Manually configure server settings or additional server types radio button, and then click Next. 19. In the Internet E-mail Settings window, enter the requierd information, then click More settings. 20. In the Internet E-mail Settings window that appears, click the Outgoing Server tab, and enter the following. 22. You are returned to the Internet E-mail Settings page. Click Next. 23. If you clicked the box for Test Account Settings by clicking the Next button the Test Account Settings window appears for you to confirm your account settings. Once completed, click Close. 24. You are returned to the Add New Account page. Click Finish. 25. If your computer is connected to the Internet, make a test e-mail. 27. From the File menu, choose Info . Click on Account Settings and then click on Add and remove accounts or change existing connection settings. 28. Click the E-mail tab, click on the account you want to change and then click the Change button. 29. Please confirm and/or change the information in the Internet E-mail Settings window. Click the More Settings button. 32. The Internet E-mail Settings page will appear. Click Next. 33. If you clicked the box for Test Account Settings by clicking the Next button the Test Account Settings window will appear for checking your account settings. Once completed, click Close. 34. You are returned to the E-mail Accounts page. Click Close. 35. If you are connected to the Internet, make a test e-mail. 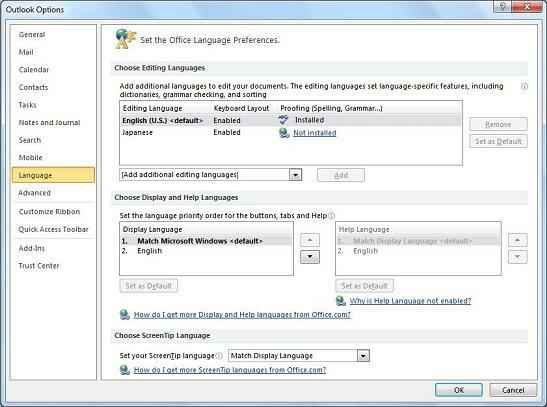 Should you wish to change the format in which your email is composed or the language in which you compose your email, see below for where to find the appropriate Outlook 2010 settings. 36. Click on File and then choose Options. 37. Click on Mail and in the Compose messages section click on the drop down box and choose from one of the available format, for example Plain Text . 38. Click on Language. The settings shown are at your discretion. After changing any settings, click OK.
39. In the Outlook 2010 client window, click on Send/Receive tab. Click on Preferences, and then click Work Offline or Work Online . Should you need to delete an account in Outlook 2010, please follow the steps below. 40. From the File menu, choose Info . Click Account Settings and then choose Add and remove accounts or change existing connection settings. 41. Click on the account you want to delete so that it is highlighted. Click on the Remove button to delete the account. 42. You will be asked if you want to delete the account. If you do want to delete the account, click OK and the account will be deleted. It is useful to test the settings you have made by sending a test e-mail to your Asahi Net e-mail address. If Outlook 2010 sends the e-mail and receives the e-mail, and the e-mail is in the format you require, then you have completed the settings. Any test e-mail that was created with incorrect Outlook 2010 settings and could not be sent will be sitting in the Outbox - it should be deleted before you change settings and try to make another test e-mail. 43. Click on the Home tab, then click on New E-mail. 44. Address the e-mail to your Asahi Net e-mail address. 46. To download your e-mail, click on the Send/Receive tab, then click on the Send/Receive All Folders button. 47. 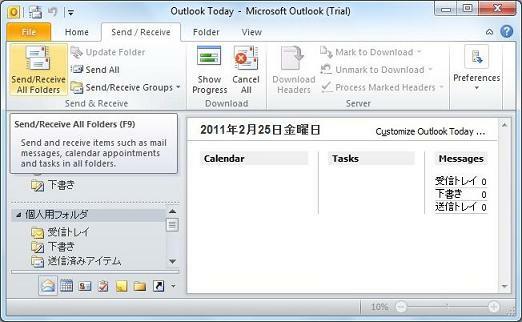 If you are online, and the Outlook 2010 settings are correct, then you should be able to send and receive your e-mail. If you were unable to receive e-mail or send e-mail, click here to check your settings. Using Asahi Net's Virus Check Service? You'll want to change your settings. Click here for details. Thank you for visiting the [Outlook 2010] page of Asahi Net, the Internet provider.